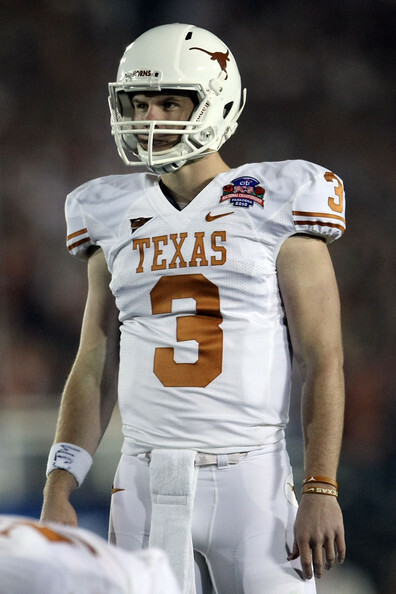 With Garrett Gilbert‘s surgery, do you think it would be possible for him to come back as a starter for Texas? (NICCO) With or without the surgery, Gilbert has not demonstrated the ability last year nor this season to be the starting QB at the University of Texas. Because a lot of his negative plays (interceptions, sacks, fumbles, inability to audible) were not a product of a bad shoulder as much as they were a product of bad decision making. I know you cover football regularly so I was wondering whether or not you’ve seen or think a quarterback can come back from failure and injury like this and make a successful career out out of it? (NICCO) Career? Hmmm. I still not certain how devastating the injury is in the big scheme of things. A lot of QBs have successfully come back for surgery. However, the “failure” aspect and poor footwork, and general bad decision-making, and below-average stats for the talent he has had at his disposal…. maybe Greg Davis should have ran the productive Lake Travis HS offense, or maybe Gilbert is simply a bust with tangibles. Also, comparing Garrett Gilbert’s high school stats with those of his first three years would you consider his career a failure or would you say he still has promise? (NICCO) Garrett was a high-school All-American for Lake Travis High School , and HS Player of the Year according to certain publications, so yes, unfortunately, his statline would show he is a bust. Also, what do you feel his position on the team will be now that he is out for the season? Do you think it would be likely that he transfer to a different D1 or D2 school? (NICCO) I believe it is in his best interest to immediately enroll into another school mid-semester (if that is possible). Case McCoy has proven in just a few quarters that he is more in line with what Bryan Harsin needs to run his offense. And David Ash is probably ahead of Garrett in the ability to move the chains as well.